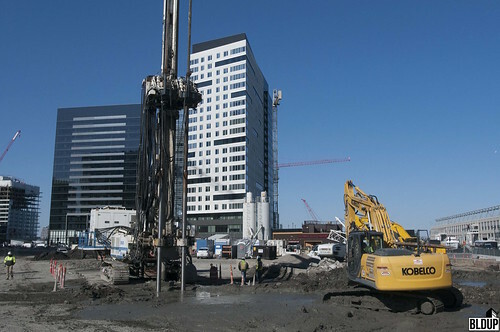 Three mixed-use towers containing 1.3 million square feet under construction across 3.5 acres in the Seaport District. 717 residences and 125,000 square feet of retail and restaurant space will be built at EchelonSeaport. Two of the EchelonSeaport towers will contain 447 luxury condominium residences, and one tower will contain 270 luxury apartment residences. 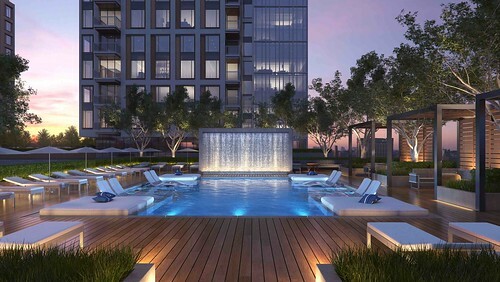 Resident amenities at EchelonSeaport will include two signature outdoor pools, an indoor pool, expansive sun decks, engaging courtyards, and oversized private terraces. Retail and restaurants will be located across EchelonSeaport's first two stories and will be centered around a new pedestrian mall and courtyard. Multiple passages and streets will be constructed throughout EchelonSeaport, featuring outdoor seating on multiple levels, distinctive artwork, and beautiful tree canopies. 560 vehicle parking spaces will be located at EchelonSeaport in an underground parking garage. Construction of EchelonSeaport will span three years, with completion slated to be phased between late 2019 and early 2020. 133 Seaport, a Regent Collection, and 135 Seaport will include a total of 447 luxury condos. The rental tower at EchelonSeaport will feature 270 luxury apartment homes. When complete EchelonSeaport will include 1.3 million square feet of development with 717 residential units total and 125,000 square feet of retail and restaurant space. EchelonSeaport's second condo tower is taking shape at 135 Seaport Boulevard with facade install underway. The facade is a mix of glass and precast concrete to mimic stone in keeping with Boston's traditional building materials. EchelonSeaport's first condo building, 133 Seaport is also rapidly moving forward with window install nearly complete and balconies in place. Construction of 133 Seaport is set to be complete in October of this year with 135 Seaport not far behind in late 2019. Both 133 & 135 Seaport are part of the Regent Collection. Regent Hotels & Resorts, known the world over for award-winning, white-gloved five-star service, will bring a sense of style and attention to service detail second to none to EchelonSeaport. EchelonSeaport's first two stories and will be centered around Autumn Lane, a new pedestrian mall, and Harbor Square, a new courtyard. Multiple public access points will be added to create a vibrant streetscape featuring outdoor seating on multiple levels, distinctive artwork, and beautiful landscaping. Window and facade install is ongoing for 133 Seaport Boulevard, the flagship residences at EchelonSeaport. The first phase of this 1.3 million square foot project will feature 255 luxurious condos. As the project progresses the array of outdoor terraces the tiered design will create really begin to stand out. Along with these private outdoor spaces, residents will also have access to the building's 60,000 sf of amenity space including 3 distinct pools, various lounge spaces, and a state of the art fitness center. Construction of 133 Seaport is expected to be complete in late 2019. In total EchelonSeaport will feature 717 residences along with 125,000sf of restaurant and retail space. Full completion of the project is expected in 2020. From the corner of the convention center looking out onto the rising development that will be EchelonSeaport, Becky Mattson head of the Boston/East Coast Office of Cottonwood Management, provided insight into the development team's design and progress on the massive project. At around 1.3 million sf, EchelonSeaport is the second largest construction project in Boston currently just behind the Encore Boston Harbor. The three-tower structure is being built in phases with window and facade installation underway on the first tower at 133 Seaport Blvd. The development team expects completion of this first phase in just about 1 years time. For the design, Cottonwood chose to work with two architects, Kohn Pedersen Fox Associates, and CBT Architects. KPF was chosen to bring an international flair to the project and CBT to ensure the interior finishes appealed to the local market. Ms. Mattson also discussed how the distinct stepped design of the buildings will allow for numerous coveted corner units and the steps create amazing outdoor terrace space with harbor or ocean views. EchelonSeaport will also offer 60,000sf of amenity space designed by Jeffrey Beers to be "spaces people actually use, not just nice looking in a brochure". Along with three pools, a fitness center, and a wine tasting room, one of the most unique amenities will be an innovation space with programming from the MIT designX program. Once fully complete in 2020 EchelonSeaport will bring a new lifestyle concept to the ever-changing Seaport District. A view of the current construction progress from Seaport Blvd. A large crowd turned out Tuesday morning for the topping off and a special look inside the impressive construction site that will be EchelonSeaport. After almost 1 year of construction the final beam for 133 Seaport Boulevard signed by the construction team, project workers, and the crowd, was put in place. The nearly 4-acre site, once home to a series of parking lots will include 717 residential units and 125,000 square feet of retail/restaurant space. Alex Shing, CEO of Cottonwood Management, told the crowd EchelonSeaport will be the flagship community for his team and looks forward to Cottonwood’s continued involvement in Boston. Cottonwood's goal with EchelonSeaport was to use the most advanced urban planning to construct a project that integrates with the existing community. The large central courtyard will host open-air markets and public events that will bring the neighborhood and residents together. Mayor Walsh also addressed the crowd, thanking the development team for their commitment to the City of Boston and their efforts in helping Boston reach its goal of 53,000 new units of housing by 2030. Walsh also applauded the innovative design, making special mention of the sky bridge that connects the buildings. Pictured above: A view from the courtyard inside EchelonSeaport, looking up at the sky bridge. EchelonSeaport will offer residents 5-star white glove service along with 60,000 square feet of amenities including 3 pools, indoor basketball court, golf simulator, and open-air dog run. Completion of the project is expected in phases between late 2019 and early 2020. EchelonSeaport representatives have announced that the framework for the building's pedestrian bridge has now been installed. The unique design will connect two of the towers in this 1.3 million-square-foot project in Boston's Seaport. In total the development is set to include 447 luxury condos along with 270 rental units. All residents will have access to the projects three pools, sun decks and numerous other resort style amenities. The first two floors of EchelonSeaport will also include retail and restaurant space centered around a new pedestrian mall and courtyard. Construction of EchelonSeaport with be completed in phases between late 2019 and early 2020. Frame construction is underway at one of the Seaport's most anticipated new developments, EchelonSeaport. The massive project is set to include 717 residences and 125,000 square-feet of retail space. Resident amenities will include multiple pools, a two-story basketball court with tech wall that can broadcast games or fitness classes, and an innovation center. The retail space component of the project will be centered around a new pedestrian mall and public courtyard featuring outdoor seating on multiple levels. The multi-phase project is set to be completed between late 2019 and early 2020. Plumbing installation underway in Tower 1, Tower 2, and Tower 3. Installation of plumbing fixtures, plumbing equipment, and all associated plumbing piping has begun. Work is being performed in Tower 1, Tower 2, and Tower 3 (Levels 1-26). The three mixed-use towers containing 1.3 million square feet are under construction across 3.5 acres in the Seaport District. 717 residences and 125,000 square feet of retail and restaurant space will be built at EchelonSeaport. Two of the EchelonSeaport towers will contain 447 luxury condominium residences, and one tower will contain 270 luxury apartment residences. Projected completion date is January 2020. Condo prices at EchelonSeaport to start from $700,000 and rise to $5 million. The property, slated to open in late 2019, has units ranging from studio to three-bedrooms. The project, made up of three buildings, will contain 717 apartments and condos in total. The 447 condos set to hit the market make up for the most available in the seaport district as of May 2018. Resident amenities at EchelonSeaport will include two signature outdoor pools, an indoor pool, expansive sun decks, engaging courtyards and oversized private terraces. Retail and restaurants will be located across EchelonSeaport's first two stories. 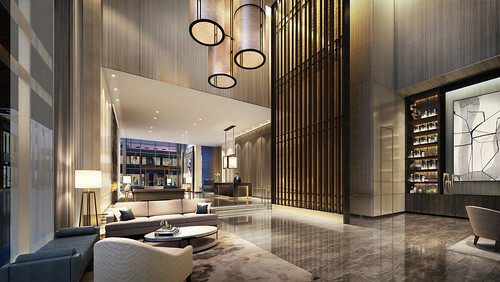 Noted interior designer Jeffrey Beers International (JBI), who has designed amenity spaces at luxury residential towers such as New York City’s One57, has been selected to design the lobbies and amenity spaces at the two luxury condominium towers of the $900 million EchelonSeaport mixed-use development. Beers will design spaces such as the towers’ sky lounges, wine room, fitness spaces, outdoor pool terraces and library. Both towers will be connected by a landmark pedestrian bridge. “Threading together art and intellect, simplicity and culture, EchelonSeaport will attract residents that desire a residence exuding sophistication, community and authenticity,” said Alex Shing, Chairman and CEO of EchelonSeaport co-developer Cottonwood Management, in a prepared statement. The condominium towers’ interior design will place a strong emphasis upon community. “We have a wealth of amenities, especially outdoor spaces, which blend into indoor spaces, each servicing diverse functions and appealing to different tastes,” said Beers in a prepared statement. “They share a common goal: Echelon’s amenities are an extension of the home, they are about expanding the definition of your residence, bringing people together and creating connectivity.” Beers will also design the lobby and amenity spaces of EchelonSeaport’s apartment tower, whose design will be inspired by the historic Fort Point neighborhood and will blend modern luxury with a unique urban, industrial style. Natixis has provided $480 million in construction financing towards Echelon Seaport, a 1.3-million-square-foot mixed-use development underway in the Seaport District that is one of the City’s largest projects currently underway. The loan will finance the $900 million Echelon Seaport’s 733 luxury apartment and condominium residences and 125,000 square feet of ground-floor retail. The 3.5-acre Echelon Seaport will be constructed across three new buildings and is the latest installment in the Seaport District’s 23-acre Seaport Square development plan. “We’re thrilled to be financing Boston’s Seaport Square project, which illustrates our ability to provide borrowers tremendous capital markets access and unique, tailored deal structures and financing solutions,” said Greg Murphy, Natixis’ Americas Head of Real Estate Finance, in a prepared statement. Construction of Echelon Seaport began in March 2017, with completion expected by the first quarter of 2020. The development will be the first to bear proponent’s Cottonwood Management’s new Echelon lifestyle brand, and will feature amenities including a wine room, outdoor and indoor swimming pools, a spa treatment room and an innovation center. Residences will feature luxurious finishes such as floor-to-ceiling windows, Porcelanosa cabinetry and porcelain tile. Over 400 of Echelon Seaport's residences will be condominiums, and the remainder will be apartments. Treviicos has completed construction of the 104-panel slurry wall foundation of Echelon Seaport, a $950 million, 1.3-million-square-foot mixed-use development situated on 3.5 acres in the heart of the Seaport District. The slurry wall spans 2,172 linear feet, and has a total concrete surface area of 122,000 square feet. The first slurry wall panels along Seaport Boulevard are now being excavated, and concrete cap beams have been constructed at the top of the excavated panels. Echelon Seaport’s slurry wall has a maximum depth of 154 feet and an average depth of 65 feet; each panel is 30 feet thick. Within the excavated section of the slurry wall, an internal horizontal bracing system has been installed to retain the slurry wall throughout excavation and foundation construction. Treviicos will use a combination of a one-to-two-level internal bracing system and a total of 349 tiebacks to support Echelon Seaport’s slurry wall. Tiebacks are now being installed along Seaport Boulevard within tieback sleeves injected into the slurry wall by Treviicos. Cement grouting is also underway along the excavated slurry wall in order to strengthen the wall’s concrete. 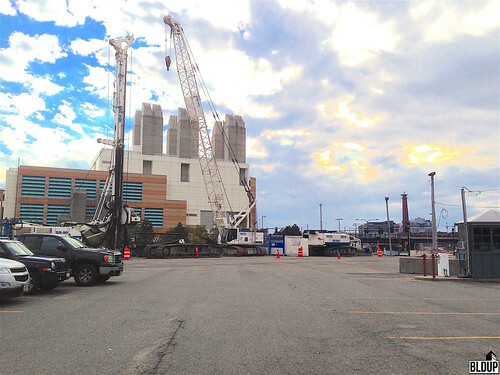 Construction of the $900 million, 1.3-million-square-foot Echelon Seaport development’s below-grade slurry wall foundation is now underway. The 3.5-acre project site is being prepared for excavation of trenches for the wall’s first sections, which will be excavated using slurry wall rigs with hydromill and grab excavators. Steel reinforcement cages will be installed in excavated slurry wall trenches, after which concrete will be poured into installed reinforcement cages to complete the slurry wall. Afterwards, slurry wall sections will be excavated, exposing the hardened concrete surrounding Echelon Seaport's foundation and underground parking garage. Echelon Seaport, a $900 million, 1.3-million-square-foot, three-tower mixed-use development located steps from Boston Harbor, has broken ground in the Seaport District. Formerly known as Seaport Square Block M, the development will be the inaugural project of Cottonwood Management’s new international Echelon lifestyle concept. A groundbreaking ceremony for Echelon Seaport was held this past Wednesday (June 14th, 2017) on the project site, where initial site preparations are already underway. Guests at the groundbreaking ceremony included Governor Charlie Baker, Mayor Marty Walsh and world-renowned Chef Ming Tsai. "This project paves the way for more people to see the Seaport as a place to not only work in and visit, but also a place to live in and call home," said Mayor Martin J. Walsh. "I look forward to the Seaport continuing to become an innovative, welcoming neighborhood for all." Boasting 733 luxury residential condominiums and apartments, Echelon Seaport will feature two signature outdoor pools, an indoor pool, expansive sun decks, engaging courtyards and oversized private terraces. Sales of Echelon Seaport condominiums will commence this Fall. Echelon Seaport’s three towers will be united by a destination piazza, featuring an architecturally striking landmark bridge, outdoor seating on multiple levels, distinctive artwork, beautiful tree canopies and more than 125,000 square feet of luxury restaurants and retail lining the multiple passageways and streets leading to the central courtyard. A groundbreaking ceremony for the $850 million Seaport Square Block M mixed-use development in the Seaport District will be held next Tuesday. Speakers at the ceremony will include Governor Charlie Baker and Mayor Marty Walsh, in addition to a Block M brand unveiling by Cottonwood Management Chairman and CEO Alexander Shing and a special presentation by James Beard award-winning chef and Blue Dragon restaurant owner Ming Tsai. Tsai's presentation follows the chef's announcement that he will open a new fast-casual stir-fry restaurant called ChowStirs next year. Tsai's renowned Blue Ginger restaurant in Wellesley closed earlier this month after 19 years in business. Tsai has owned and operated the Blue Dragon restaurant in Fort Point since 2013. The Block M development team did not announce Tsai will open a restaurant at Block M. Block M is Cottonwood Management's premiere development in Boston and will feature 730+ luxury residential units with 125,000 square feet of ground-floor retail and restaurant space, with completion expected by early 2020. Cottonwood Management, developer of the 1 million+ square foot Seaport Square Block M mixed-use development in the Seaport District, announced today that pre-construction work has commenced at Block M, and that an official groundbreaking ceremony will take place in May following pre-construction completion. Pasadena, California-based Cottonwood has also opened a new Boston regional office at the new 101 Seaport Class A office building steps from the Block M construction site. Part of the 101 Seaport space will serve as Block M's future residential sales center. "This is a major milestone for our team, to open our new office space and to start pre-construction in the same month. [Block M] is Cottonwood’s first Boston project to break ground, and we look forward to expanding in Boston along with our other activities on the East Coast,” says Alexander Shing, Chairman and Chief Executive Officer of Cottonwood. Full completion of Block M is expected in early 2020. In an official press release, developer Cottonwood Management announced Thursday that it has appointed Edward Vydra to Senior Vice President and Mike Schumacher to Senior Vice President of Development. Vydra and Schumacher will join Rebecca Mattson, Head of East Coast Development, in developing the $850 million-plus mixed-use Seaport Square Block M project, which is expected to break ground this fall. Vyrda will be the leading senior project executive for Seaport Square Block M, and Schumacher will oversee the successful implementation of all construction activities for the project. The Seaport Square Block M project will entail the construction of three mixed-use towers featuring approximately 733 residential units, including both apartments and condominiums, and 125,000 square feet of retail located in the heart of the Seaport District on what is now a surface parking lot. “Cottonwood is preparing for a momentous few months with the groundbreaking of our first development project in Boston. Ed and Mike’s expertise is invaluable as we look to create a state-of-the-art residential community experience reflective of the Seaport District’s dynamic, innovative spirit,” says Alexander Shing, Chairman and CEO of Cottonwood Management Group. Vydra and Schumacher have extensive backgrounds in commercial real estate (CRE). Vyrda previously served as a Managing Director at Taurus Investment Holdings and has also worked with Lend Lease Real Estate Investments, WS Development and CareMatrix. Schumacher previously held a 19-year tenure at Boston Properties, most recently serving as Vice President of Construction. At a public meeting held this evening at District Hall in Boston’s Seaport District, developer Cottonwood Management gave an update on construction progress at Seaport Square Parcels M1 and M2. Boston Global Investors (BGI) Managing Director John Hynes also gave an update on other active Seaport development projects. A second developer, Regent Hotels and Resorts, has joined the M1 and M2 development team and will manage the M1 and M2 property. Contrary to prior reports, there will not be a hotel or short-term rental apartments at M1 and M2. The development team anticipates to file for building permits for M1 and M2 over summer 2016. Foundation work is anticipated to commence in October 2016 with construction of slurry walls. Foundation excavations and site work would be completed by September 2017. Ground floors of M1 and M2 would be completed by February 2018, with full project completion by August 2019. 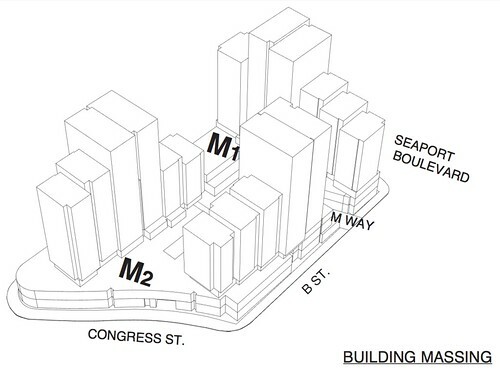 M1 and M2 is tied with One Seaport Square for largest Seaport development, at 1.1 million square feet. Three towers are currently proposed as part of the M1 and M2 development plan. The towers would contain residential and retail space. The M1 and M2 project is designed to accommodate home ownership. Two of the towers would contain condominium units. The third would contain apartments and could potentially change to condominiums depending upon market conditions. A total of 750 residential units will be built at M1 and M2. Two parking garages would be built at M1 and M2 with a total of 560 striped spaces. The MBTA Silver Line tunnel cuts directly through the project site and separates the parking garages. Both parking garage entrances will be located off of East Service Road, which will soon be renamed Pier Four Boulevard. The amount of affordable units at M1 and M2 is not yet finalized; there will likely be a balance of on site and off site affordable units to satisfy affordable housing requirements. M1 and M2 is designed to accommodate and encourage pedestrian use. A new retail-lined pedestrian mall, Autumn Lane, will cut through the project site, leading to a central courtyard space, Harbor Square. There will be a total of four pedestrian connections into the M1 and M2 project. In other news, CapitalOne 360 Cafe will occupy the ground floor of the under-construction Block H Offices on Seaport Boulevard. At One Seaport Square, The Benjamin (Parcel B) will top off within the next four weeks. Parcel C will follow shortly afterwards, topping off within the next eight weeks. Expected completion of One Seaport Square is in May 2017. 80% of retail space has been pre-leased at One Seaport Square. Across Seaport Boulevard from One Seaport Square, Our Lady of Good Voyage Chapel’s shell is anticipated to be complete by July 2016, with the interior complete by November 2016. Annual real estate taxes upon total buildout of the Seaport Square parcels will be $30M per year. 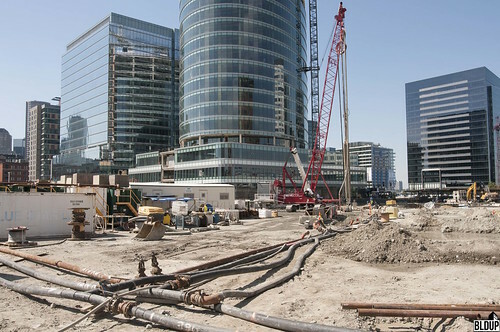 An estimated 50,000 total construction jobs will be created across Seaport Square. More information on M1 and M2 is posted below. Deeds have been recorded for Seaport Square parcels M1 and M2 transferring ownership of the parcels to Boston Seaport M1&2 Land LLC, a limited liability company comprised of Chinese private equity firm Celona Capital and California-based developer Cottonwood Management. Cottonwood Management will develop parcels M1 and M2. Chinese firm Celona Capital is set to officially acquire Seaport Square parcels M1 and M2 this week for over $100M. Three residential towers are approved for construction on parcels M1 and M2. Stay tuned for additional information and deeds. BOSTON – March 8, 2017 – Cottonwood Management Group is solidifying its presence in the East Coast real estate market with the opening of its new Boston regional office at 101 Seaport Boulevard in the burgeoning Seaport District. Simultaneously this month, the California-based asset management and development company has commenced pre-construction on its Seaport Square Parcel M1M2 development next door. “This is a major milestone for our team, to open our new office space and to start pre-construction in the same month. M1M2 is Cottonwood’s first Boston project to break ground, and we look forward to expanding in Boston along with our other activities on the East Coast,” stated Alexander Shing, Chairman and Chief Executive Officer of Cottonwood. 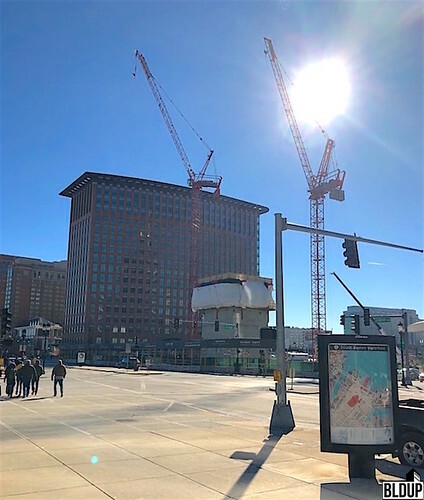 One of the city’s largest and most anticipated developments in the Seaport, the M1M2 Project consists of 1 million+ square feet of mixed use development over 3.5 acres in Seaport Square. The residential component includes 730+ residential units, with two condominium towers and one luxury rental tower. In addition to the residences, the project includes 125,000 square feet of premiere two-story retail and restaurants centered around a vibrant public courtyard. Construction is scheduled to span three years with phased completion dates in late 2019 to early 2020. In addition to its regional office, part of Cottonwood’s Seaport Boulevard space will be used as the future sales center for the project’s residential component. Cottonwood is developing this space to be immersive and reflective of the technology, design, and amenities that will distinguish the property. Cottonwood is preparing for an official groundbreaking for the project, anticipated in May 2017, to occur upon completion of the initial pre-construction phase of work. Headquartered in Los Angeles with offices in Boston and New York, Cottonwood Management is a privately-held real estate asset management and development company with over USD 2 billion in assets under management. Building on its entrepreneurial, private equity roots, Cottonwood combines in-house structured finance capabilities with their operational expertise to unlock the full value of real estate opportunities. Its structured finance and real estate teams are comprised of seasoned private equity, finance and real estate professionals with national and international expertise in acquisitions, asset management and development. In addition to Los Angeles, Boston and New York, the Company also manages real estate assets in other major US cities including San Francisco, Seattle, San Jose, Las Vegas, Phoenix and Houston. Additional information is available at www.cottonwoodmgmt.com. BOSTON – Sept. 7, 2016 - Cottonwood Management Group, a national real estate development and management company with Boston and California offices today announced the appointment of Edward Vydra to Senior Vice President and Mike Schumacher to Senior Vice President of Development. With nearly 50 combined years of expertise in their respective financial management and construction industries, Vydra and Schumacher will join Rebecca Mattson, Head of East Coast Development in the Group’s Boston office, to execute the plans for Cottonwood’s premier residential and retail development at Seaport Square Parcels M1M2. Vydra will be instrumental acting as the leading senior project executive for the $850 million-plus Seaport Square Parcels M1M2, and cultivating growth and stability of the company’s real estate portfolio. A real estate expert with more than 25 years of experience, Vydra has overseen more than three million square feet of development and managed assets exceeding $1 billion throughout his career. Prior to joining Cottonwood, Vydra served as a Managing Director at Taurus Investment Holding’s Boston office with key acquisition, asset management, and development responsibilities in its New England portfolio. Vydra, a Boston/New England real estate veteran has held similar management positions for Lend Lease Real Estate Investments, WS Development, and CareMatrix. Mike Schumacher, as Senior Vice President of Development, will oversee the successful implementation of all construction activities for the Cottonwood project in Seaport. In his role, Schumacher will lead project development strategy, design execution, and construction management. Schumacher brings 24 years of real estate expertise to the Group, having lead and contributed to nearly $1 billion in completed developments and asset improvement projects in New England. Prior to Cottonwood, Schumacher held a 19-year tenure at Boston Properties, most recently serving as Vice President of Construction. Schumacher has been an integral team member for notable projects in Boston, including the 1 million-square-foot strategic repositioning of the Waltham office park Bay Colony, and the current $1 billion mixed-use development on the former Boston Garden site. Vydra earned his Bachelor of Science degree in Civil Engineering from Tufts University. Schumacher holds a Bachelor of Arts degree in Architecture from Princeton University. Established in 2011, Cottonwood Management, LLC is a privately-held real estate asset management and development company with over $2 billion in assets under management. Founded by a group of MIT graduates, Cottonwood Management’s team is comprised of a diverse group of dedicated, experienced real estate professionals with national and international expertise in real estate acquisition, asset management and development, paired with local market knowledge and depth of experience in Boston. Cottonwood Management has offices in Los Angeles and Boston, with assets under management in major cities, including but not limited to, San Francisco, San Jose, Los Angeles, New York, Boston, Las Vegas, Phoenix and Houston. Additional information is available at www.cottonwoodmgmt.com.